Summary: The challenges in BSA/AML continue to morph and change, so community bankers must adapt. A recent survey highlights some issues and best practices. Doctors always remind people to wash their hands with soap and water (particularly during flu season), eat good food and get plenty of rest to stay healthy. Maybe it is time someone warned you about the risk of holding back a big sneeze. 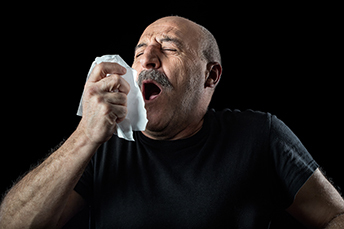 Believe it or not, doctors in the UK reported a 34Y old man who felt a sneeze coming on tried to contain it and was hurt by doing so. Doctors say one of the worst things you can do is try to clamp your nose and mouth shut to try and quiet or contain a big sneeze. As for the UK man who did just that - he blew a hole in the part of the throat behind the mouth and nasal cavity that left him unable to swallow or speak for 7 days. Now that you know what not to do, perhaps the old saying an ounce of prevention is worth a pound of cure will also apply when your nose begins to itch the next time. That old saying also applies to the banking industry and more specifically around actions bankers have been taking related to the Bank Secrecy Act (BSA) and Anti-Money Laundering (AML). Unfortunately, criminals seem to keep upping their game as they attack banks and try to defraud them and their customers. Given the global nature of thieves and the fact that some appear to be state sponsored, it is difficult for community banks to manage this increasing risk. Smaller fraud-detection budgets and less staff could add more risk, and community bankers are keenly aware of this. Further, ABA research finds banks with assets $1B to $9B have an average of 4 full-time compliance employees dedicated to BSA/AML functions, while those below $1B may only have 1. As this information spreads, community banks are at risk of being seen by money launderers, traffickers and other bad guys as one way to get into the financial system. The challenges in BSA/AML never go away and they definitely continue to morph and change, so bankers must adapt in kind. To start, the FDIC has identified 6 best practices for compliance that include: comprehensive risk assessment, appropriate policies and procedures, adequate monitoring programs, strong training programs, thorough independent testing and qualified employees overseeing day to day operations. To gain a deeper understanding of where things are now, we also looked at a survey conducted by ARC Risk and Compliance from late last year that looked at best practices and issues in the BSA/AML departments and activities of banks. The survey grouping was roughly split between banks with assets <$1B (45%) and those >$1B (55%). The survey found the highest regulatory priorities cited by respondents that surfaced during their most recent regulatory exam were focused on: transaction monitoring (51%), know your customer (KYC) and customer due diligence (CDD) processes (36%) and enhanced due diligence (EDD) programs (32%). Meanwhile, by topic significance, respondents said regulators during exams were focused on how the bank was managing: customer risk (45%), KYC/CDD/EDD (45%), suspicious activity reporting (SAR) and current transaction reporting (CTR) for FinCEN (31%), risk assessment (28%) and insufficient AML policies and procedures (25%). Finally, those bankers who were thinking things might calm down in BSA/AML given all of the talk of regulatory reform should know 85% of respondents said regulatory scrutiny increased since their prior exam and almost half (48%) had to augment internal resources with external ones to address program issues that surfaced during exams. Well, at least you now know some of the issues swirling around BSA/AML, so you can take preventative measures to help protect your bank and stay healthy along the way. CNBC reports Bank of America has partnered with Amazon to provide loans to merchants. Amazon reportedly wanted to partner with the bank to reduce its credit exposure to such loans and provide more access to credit for merchants leveraging Amazon Lending. Amazon Lending originates loans up to $750,000 and issued $661mm in 2016 and $662mm in 2017 according to Amazon's annual report. There have been plenty of speakers flooding the airwaves as of late. Comments include: St. Louis President Bullard - 4 rate hikes in 2018 "seems like a lot", doing "a bunch of hikes this year" could restrict growth, and the neutral fed funds rate remains "pretty low"; FOMC minutes - "A majority of participants noted that a stronger outlook for economic growth raised the likelihood that further gradual policy firming would be appropriate"; Dallas President Kaplan - continues "to believe that gradual and patient removals of accommodation will increase the likelihood of extending the economic expansion" and that history shows waiting " too long to remove accommodation at this stage in the economic cycle, excesses and imbalances begin to build." 1) Choice Financial Group ($1.3B, ND) will acquire Venture Bank ($730mm, MN) for an undisclosed sum. To celebrate Community Banking Month in April, we want to highlight some of the ways your bank and its employees have served your communities. If you have stories to share, see today's BID email for more information.